Bring a bit spring into your home with the fresh-coloured Claire de Lune, a real early bloomer. The inviting cream coloured petals and yellow stamens will quickly make you forget that long and cold winter. 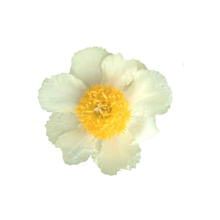 Claire de Lune is a single-flowered peony with striking, yellow stamens and a beautiful bud. The outer petals are cream yellow and will slowly turn paler after blooming. The flowers of Claire de Lune are, due to their modest size, ideal for a spring bouquet. It may not surprise you that Claire de Lune is a popular variety for wedding bouquets. These sunny flowers guarantee a festive feeling! Claire de Lune was registered in 1954 by White and Wild. Claire de Lune is only available for a short time. Don’t miss out on these pretty flowers!